My first guided New York City tour took place on December 1 on the recommendation of my cousin who has been taking advantage of these type of local events for some time (Thanks, Cuz!). Entitled “Dvorak in Love” the tour centered around Union and Stuyvesant Squares, the epicenter of Dvorak’s musical and social life in New York at the end of the 19th Century. For those of you who may not know, Antonin Leopold Dvorak was a great Czech composer and, in fact the first Bohemian composer to achieve worldwide recognition. More importantly to this blog, Dvorak took New York by storm, becoming Director of the National Conservatory of Music on East 17th Street from 1892-95 (at a staggering $15,000 annual salary) and premiering Symphony #9 (from the New World) at Carnegie Hall over 119 years ago. Dvorak’s decision to come to America and become director of the Conservatory (founded by the very wealthy philanthropic socialite, Jeanette Thurber) was based on his fascination with “American Music.” This was a natural progression for Dvorak, as the main cornerstone for his own works was often Slavic folk dances such as the mazurka, polonaise and odzemek . This love for folk music style drove Dvorak to write newspaper articles supporting the thesis that African-American and Native American music should be used as a foundation by which Americans would discover their own national style of music. In a serendipitous moment, after arriving in New York in 1892 Dvorak luckily met Harry Burleigh, a pupil at the Conservatory and one of the earliest African-American composers. Burleigh and Dvorak began a long friendship and mutual tutelage, as Burleigh was instrumental in introducing Dvorak to African-American spiritual composition. Now back to the physical tour. The neighborhood in downtown New York is surprisingly still evocative of Dvorak’s time although there have been of course some changes. The five-room brownstone at 327 East 17th Street where Dvorak lived with his wife and 6 children was demolished in 1991 and a new edifice was built to house the Mapplethorpe AIDS hospice – however there is still a plaque to commemorate Dvorak’s domicile. 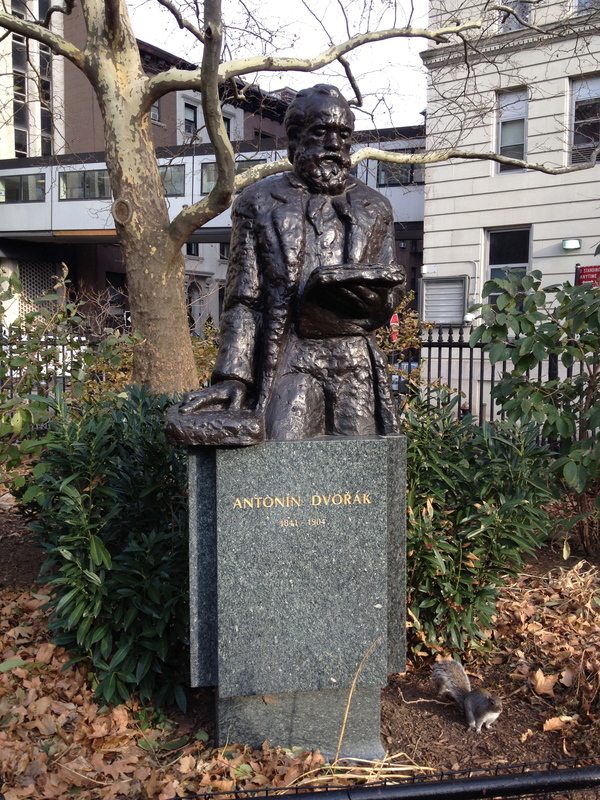 Nearby, in Stuyvesant Square, a statue sits in honor of Dvorak created by sculptor Ivan Mestrovic. Dvorak lived large and had an enormous appetite – particularly for booze. It was said that Dvorak had a pail of beer delivered to his house daily. The music critic and novelist James Gibbons Huneker became Dvorak’s drinking buddy, supposedly introducing the Maestro to his first Manhattan cocktail at the German restaurant Luchow’s (a favorite eating spot for high society as well as some of my relatives – unfortunately it did not stand the test of time). Huneker and Dvorak had legendary pub crawls beginning at Scheffel’s Beer Hall (built in 1894, still standing, though once home to Fat Tuesday’s jazz club) and it was told that Dvorak put Huneker’s supposed drinking prowess to shame. 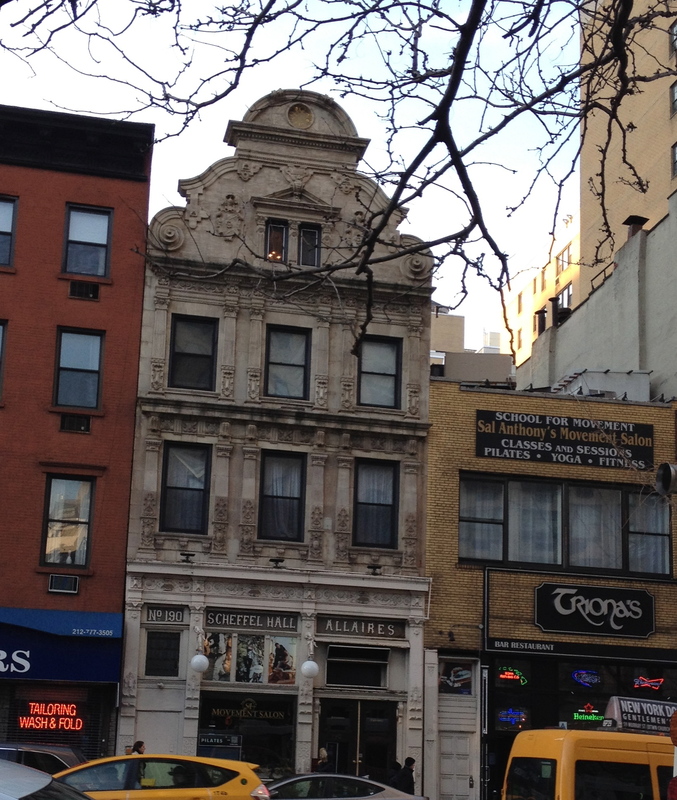 The stunning Renaissance Revival facade of Scheffel’s still can be seen right on Third Avenue. I have heard stories that this alcoholic ritual is still enjoyed today by many at other drinking establishments (not that I ever…). Crossing over Third Avenue there is almost an entire block of 19th century brownstones, and on the other side of Stuyvesant Square Park stands the Saint George Church where Harry Burleigh was a baritone soloist. In this church many of Burleigh’s art songs and spirituals were performed for the first time. Here is a six degree of separation: Burleigh introduced Dvorak to violinist Will Marion Cook who became Dvorak’s student and future Broadway composer and mentor of one Duke Ellington! Sadly, although Dvorak loved New York with all its culture and gaiety, he eventually became so homesick that he moved back to Bohemia in 1895. In Prague there is a Dvorak Museum near his last apartment – I am sorry I did not visit when I was there a number of years ago. So there you have it – fascinating stories, culture, music, architecture and statues- right in my own backyard- who would have thunk??? This entry was tagged old new york city. Bookmark the permalink.